One of my favourite authors of all time has to be Roald Dahl. It is no coincidence that he has other British authors for company in my list of favourites- Wodehouse & Gerard Durrell. His short stories for adults are deliciously dark, and his books for children have many layers to them that would delight most adults. Adding to his wonderful writing are the watercolour illustrations by Quentin Blake, bringing characters to life with his fluidic drawings. 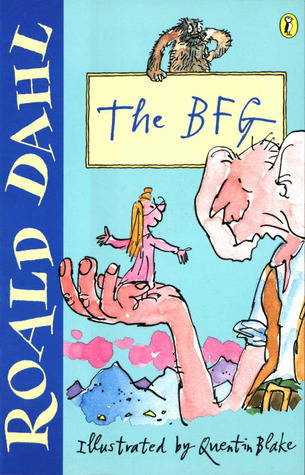 “The BFG”, or The Big Friendly Giant is in my opinion among Roald Dahl’s best works. This is the story of a young orphan, Sophie, who gets frisked off by a Big Friendly Giant for spotting him at “witching hour” of a dark night, when he was going about his activity of blowing dreams into little kid’s windows as they slept. The BFG is the “runt” of the far-away Giant world, bullied by the other giants and the only one that didn’t eat up little kids as they slept, subsisting instead on the disgusting “snozzcumber”. The book follows Sophie’s adventure with The BFG, saving the world together from the other “human bean” (as the BFG calls it) eating giants. Dahl has invented a number of scrumdiddlyumptious words in this book as part of our adorable BFG’s vocabulary, all of which have a wonderful ring to them. 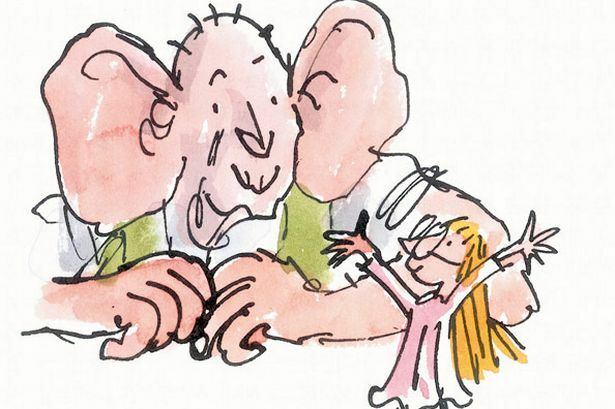 The BFG speaks with poor grammar and made-up words because he never had a chance to go to school, and sharply tells Sophie not to “gobblefunk around with words” when she tries to correct him. While many on the internet interpret “gobblefunk” to refer to Dahl’s imaginary language itself, it could also mean to mess around with words, or even be too nit-picky with them. Swizzfiggling, pigswiller, frobscottle, winksquiffler, phizzwizard and whizzpopping are only a few of Dahl’s lovely inventions, all of which are perfectly understandable in context. Our lovable giant also refers to Charles Dickens as “Dahl’s Chickens”, getting a chuckle out of the best of us. I learned recently that DreamWorks has picked up the rights for the film which is due to be released in 2016. I can imagine it would be beautifully animated, what with the BFG’s huge collection of colourful airy jelly-like dreams lined up in thousands of glass jars, cottony pink dreams floating in giant land and beautifully coloured bubbles of dream-bits floating up BFG’s cave. This one’s going to be a golden phizzwizard!